Resveratrol Forte capsules 100 pcs. Bio+Active Garden Cress-germ capsules 100 pcs. Our ancestors must have suspected something, because the ancient Greeks and Romans attached great importance to its consumption. This is the oldest cultured plant of ours which has been already used in popular medicine for centuries to treat liver, eye or skin disorders. 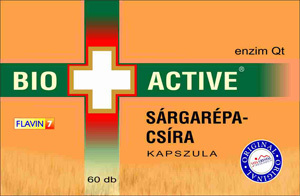 - The most pro-vitamin of vitamin A is contained by it. - Minerals Ca, K, Na, P, Fe, Mg, Cr (calcium, potassium, sodium, phosphorus, iron, magnesium, chromium). The colour of the skin might be altered into unhealthy looking and greyish by insufficient digestion, low liver function, accumulation of poisonous metals in the liver. The skin can gain a smooth tone in case of consuming carrot-germs and vitamins contained by carrot that can contribute to it, too. - Supports preservation of intactness of the epidermic tissue. - Helps digestion and purifies intestines. - Stimulates functions of suprarenal glands and pancreas. Storage: in a cool and dry place, keep out of the reach of children.